Is Your Mobile Experience Mischievous? With “mischief night”, or the night before Halloween, around the corner, it’s exciting to think about holiday treats and festive tricks. “Mischief night” celebrates the playful side in all of us by making it socially acceptable to prank our friends and engage in roguish entertainment. While this is the perfect time of year to let loose and have some fun, it is also the perfect time to think about some things we don’t necessarily want to be behaving badly. And for recruiters in 2017, that means evaluating mobile recruitment trends. Today, having a strong mobile recruitment strategy is vital to a company’s overall recruitment success. And a significant part of that mobile strategy is having a robust mobile app. The most important factor to having a well-behaved, friendly mobile recruiting app is to think about the users. Who are the targeted audience for these mobile apps? For the most part, it’s candidates. 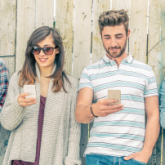 Candidates using mobile recruiting apps are using it for one reason: convenience. Candidates are constantly on the go, but they are always connected to their mobile devices. Therefore, it is easy for busy candidates to browse open positions, review job details, and apply for positions from their phones as opposed to having to go home and logon to their desktop computers. 1. Offer an Easy Interface for Candidates. User experience (UX) should be top-priority when it comes to mobile application design. Companies can enhance candidate satisfaction by improving the usability, ease of use, and layout of their mobile apps. According to iCIMS data, over 70 percent of job seekers used mobile devices to research a company and 40 percent used the device to apply for the job. As we see this trend emerge, we know those numbers are only going to rise. Companies need to ensure their apps and career portals are mobile-friendly. The best way to test it? Try it out for yourself. Pretend to apply for a job at your company, then ask yourself: What did I like? What can be improved? 2. Provide a Staged Application Process: In addition to being able to apply on the go, candidates also should have the ability to apply in stages. For candidates who are applying via mobile device, they may be multi-tasking. Thus, having the ability to complete the application in phases may increase their chances of not giving up on the application due to it taking up too much time and effort. Recruiter.com urges that mobile apps allow candidates the opportunity to complete an interest form, without having to fully complete an entire application. This is a great way for candidates to express their interest and connect with recruiters quickly, from their mobile devices. Check to see if your company has this capability. If it doesn’t, then ask the developers about it! 3. Utilize a Social Apply Feature: Branching off from interest forms, social application is a great way to reel in those candidates who are checking out your mobile app or career portal, but are not ready to complete an entire online application. With social apply, candidates create profiles from information in their LinkedIn, Google+, and Facebook social media accounts. This not only saves on time, but it also provides recruiters access to candidates’ social media profiles. An easy to navigate, clean UX is paramount to the success of your company’s mobile app. For more information on how to best leverage mobile within your recruiting strategies, please visit: https://www.icims.com/hiring-insights/for-employers/article-mobile-recruiting-tips-you-should-implement-today.